This is the Tokyo By Bike Loaner bike. 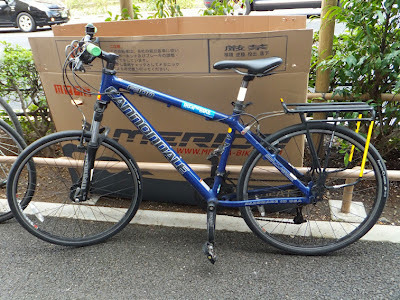 It is a recycled Cannondale that my wife bought for me from Suginami Green Cycle for the bargain price of Y18,000. Its my beater bike, my loaner bike, the one that I'll park anywhere without any fear that it will get stolen. If it did get stolen I wouldn't be too distressed over it. That is until after I spent some effort tidying it up, now I'm a little more attached to it. I replaced the mountain bike tires with 1.25 inch slicks as a mountain bike frame with slicks is my preferred set up for a commuter bike in Tokyo. 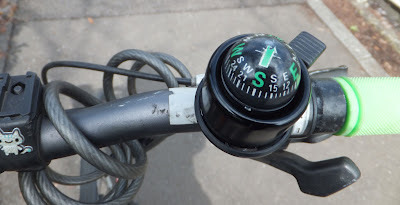 The slicks make the bike a lot lighter and much much faster, while the mountain bike frame and suspension forks ensure its tough enough to take a few knocks either on the road or in a crowded parking lot. I liberated the rear rack from a bicycle that has been abandoned outside our apartment for over a year. Its plastered with ugly yellow reflective tape, but thats OK as I do cycle more at night than in the daytime. Since I've had this bicycle it has been loaned out on at least 4 separate occasions, making tours of the Izu Peninsula and trips to the Mt. Fuji area. Currently its out on loan to a friend who is in Tokyo for a few days. How much does it cost to use the loaner bike I hear you ask? Well, so far I've received a six pack of beer, some new brake pads, and a box of Tottori dango. Not a bad haul. If you've got a handful of bicycles in your stable is one of them a loaner bike? I'm putting 1.25 inch slicks on my Trek 4300 MTB soon and heard it would look awkward. Thanks for posting this picture and dispelling that notion. I have 2 mountain bikes set up like this. For me it makes the perfect city bike/commuter bike. Tough enough to take some knocks, yet fast and light enough to keep up with traffic.